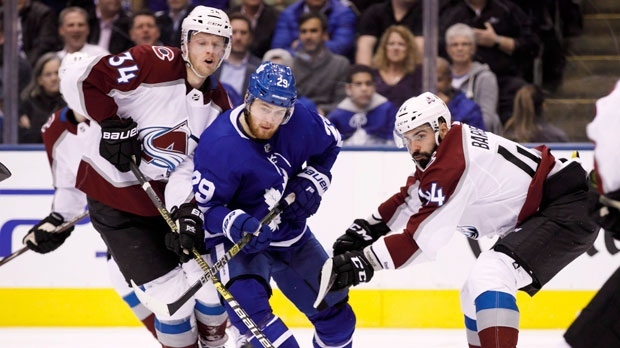 TORONTO - Carl Soderberg scored his second goal of the night with 8:15 left in the third period before adding a third into an empty net to complete his first career hat trick as the Colorado Avalanche defeated the Toronto Maple Leafs 6-3 on Monday night. Gabriel Landeskog, Mikko Rantanen and Matt Calvert, into an empty net, had the other goals for Colorado (21-17-8), which had lost nine of its last 10 games overall (1-7-2) and seven straight in regulation on the road. Igor Ozhiganov, Kasperi Kapanen and Mitch Marner replied for Toronto (28-15-2). Frederik Andersen made 32 saves in his return to the starting lineup after eight games on the sidelines with a groin injury. Auston Matthews added two assists. Colorado's top line of Rantanen, Landeskog and Nathan MacKinnon came in with an eye-popping 185 points on the season. Rantanen and MacKinnon ranked second and fifth in league scoring, respectively, while Landeskog was 19th.